I upgraded a forum to vBulletin 4.1.7 last night. Pretty straightforward stuff, only the mobile style that they half-introduced back in 4.1.2 or somewhere along the lines has been a little glitchy. 4.1.6 reintroduced the mobile style, but I blinked and 4.1.7 was released. I ended up deleting the mobile style and reimporting it from scratch (see Installing the vBulletin Mobile Style from their manual) but the grid menu button didn’t seem to work. The grid menu is where they’ve put notifications, messages, what’s new, etc. in the mobile style. In particular, I had some users ask where the What’s New feature was in the mobile style, and that’s finally been added, so it was important to get the grid menu working. 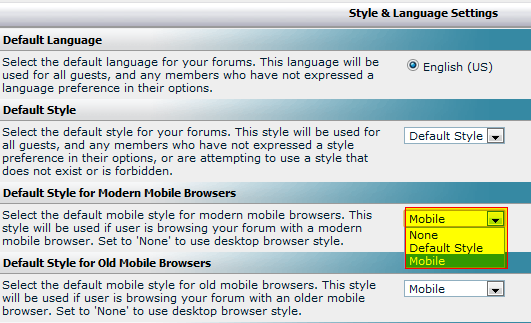 Under Settings -> Options -> Style & Language Settings, make sure to set the Default Mobile Style for Modern Browsers to your Mobile style. 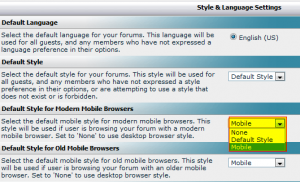 I went ahead and set as the default for Old Mobile Browsers as well, since I don’t know what the difference is. This entry was posted in Software, System Administration and tagged fix, forum, mobile, Software, theme, upgrade, vbulletin. Bookmark the permalink. Post a comment or leave a trackback: Trackback URL.